Betrayed by his renowned clutch putting and winless in his first seven PGA Tour starts this year, Tiger Woods is desperate to move out of unfamiliar and decidedly uncomfortable territory. As reports of a likely divorce from his Swedish wife Elin escalate, the American world number one has just one more chance left in 2010 to add to his major tally of 14 titles -- in next month's US PGA Championship at Whistling Straits. While Woods can never be underestimated going into any tournament, his barren run in the Grand Slam events which he covets above all others now stands at nine. His last major victory, and perhaps his greatest, came in the 2008 US Open at Torrey Pines where he beat compatriot Rocco Mediate in a 19-hole playoff, despite a painful knee and a double stress fracture of his left tibia. 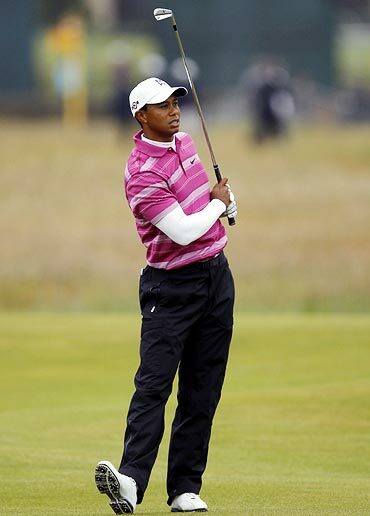 Since then, however, Tiger's world has seismically shifted. The legendary aura of invincibility he once enjoyed at the expense of his closest rivals has all but disappeared following his stunning fall from grace at the end of last year. 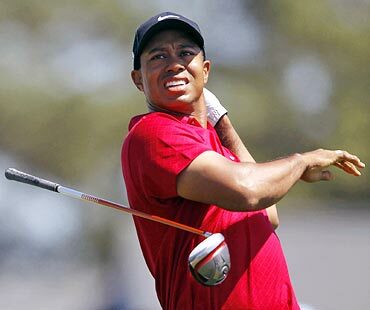 Woods stepped away from the game for five months after his double life was stunningly exposed amid revelations of a string of marital infidelities and has failed to regain his golfing dominance since returning to the circuit in April. Although he has produced flashes of brilliant shot-making and the occasional inspiring round, he has struggled for consistency. Top-four finishes in the first two majors of the year sandwiched a missed cut at the Quail Hollow Championship. He did not capitalise on a well-crafted opening 67 at last week's British Open, fading into a tie for 23rd, and in many respects he now resembles the rank-and-file player on the PGA Tour whose average score is 70. Woods remains a long hitter who has tightened his form from tee to green in recent weeks but his ability to contend over the final nine holes has been severely eroded by erratic putting. Notah Begay III, who shared a room with Woods when they were students at Stanford University, believes his good friend is close to his best but needs more time to balance his life away from the course. "He's like anybody else," Begay told a news conference earlier this week for the PGA Tour's Turning Stone Resort Championship. "It's going to take some time for the emotions to settle and for him to sort of get 100 percent focused on golf. "When somebody goes through a divorce, much less such a public one, it's going to be difficult to process what's going to happen, how they're going to cope and deal with things." Although Woods has made his worst start on the PGA Tour in 12 years with regard to winning, Begay feels the world number one is not far from producing his customary tip-top form. "He's hitting it as solid as I've ever seen and just not able to put things together," Begay said. "That's just how difficult this game is, even for a guy of his talent level." Woods, who has made a habit of dwelling on the positive aspects of his own game, was delighted with his performance from tee to green last week at St. Andrews. "I drove it great all week, hit my irons pretty good and did not putt well except for the first day," he told reporters after closing with a level-par 72 at the home of golf. 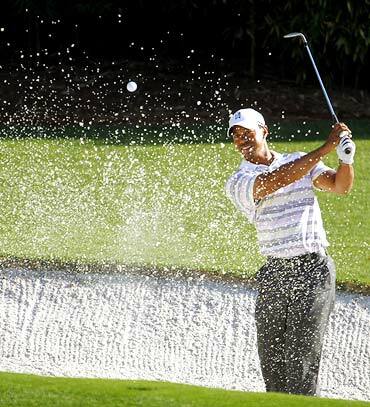 "The biggest positive is I've built on my ball-striking. I just need to get where my pace is good and start seeing some putts go in." His continual frustration on the greens was highlighted at the British Open when he abandoned the Scotty Cameron putter he had used for 11 years in favour of a new Nike model before switching back for the final round. Woods will return to the PGA Tour at the August 5-8 WGC-Bridgestone Invitational, an elite event he won for a record seventh time last year. He will then launch his bid for a 15th major title at Whistling Straits the following week. On the evidence accumulated so far this year, he cannot expect to be regarded as a favourite for the PGA Championship. Augusta National, Pebble Beach and St. Andrews had all been remarkably successful venues for him in the past and yet he failed to deliver in the year's first three majors. A Tiger triumph at Whistling Straits will hinge on improved putting. 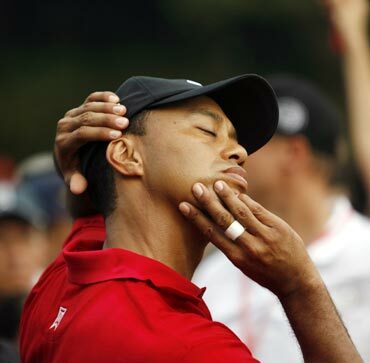 Tiger Woods' caddie set to walk out on him?